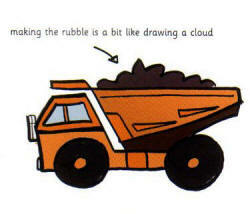 A dumper truck has a very distinctive shape.Start by drawing two wheels and link them together with a horizontal line. Finish off the cab shape as shown on the right. 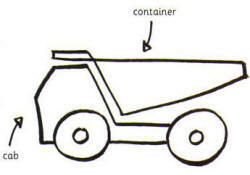 Now add the container – see if you can draw it without taking your pen off the page! Make some rubble by drawing a line with lots of curves in it. Next draw some windows on your cab. 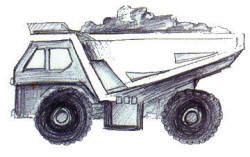 Add a few more details as shown to make your dumper truck even more realistic. Now colour it in.